This Jeep came into my family about 8-9 years ago. 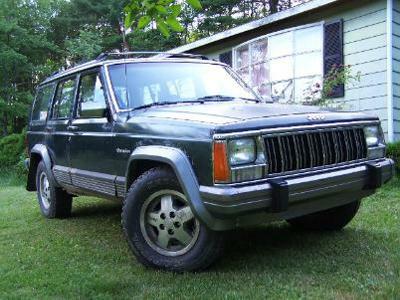 She's a 1992 Cherokee Laredo whom I've recently nicknamed "Faith" due to her timeless service when we needed her most. It was an over the winter 'beater' vehicle that was planned to be dumped off the following spring, after the loss of our 97 Dodge Dakota Sport. Fortunately that winter never came for my family! This Jeep managed to survive for almost a decade through thick and thin, in sickness and in health, till death do us part. The Jeep currently has approximately 292,000 miles on her and she's still going strong. She's got a bit of blow-by and a few knocks here and there, plus the body is beginning to fall apart. Other than that she's been a phenomenal little SUV to us. It has the 4.0L inline six, the AW4 automatic transmission, Dana 30 and 35 axles, the more desirable NP242 Select-Trac transfer case (which allows for full time 4wd operation) and power everything, all of which still works! As she stands right now she is my first vehicle which is really nice because a Jeep is the greatest vehicle to learn to drive in the snow on. I get compliments quite a bit (surprisingly) on how nice it is (although I doubt it is as nice as some others out there), but I know with a little care and love (and some spare cash to boot) she could be an extremely nice little Jeep. I plan on restoring this Jeep someday, somehow. I don't think she'll ever leave my possession, although it might sound a bit absurd, she's become a family member and it would be like getting rid of your dog or a sibling. That's the only comparison I can think of. She also has a little brother in the family. Instead of buying a newer vehicle, my father (whom so graciously gave me the Jeep) also bought a 1998 Cherokee Classic which now has 150,000 miles on it. The XJ Cherokee has proved itself time and time again to be a reliable, capable, and the go anywhere when you want to, or absolutely need to, vehicle. Long live the Jeep name and whatever it may stand for to each and every one of you! Larry's Comment: I (and most Jeep Lovers) know how you feel about your Cherokee Ian. Keep us informed on any upgrades to "Faith". Wow my friend I have to say your story warms my heart and I have to say that I loved one as much as you once, until it cheated on me with an import, but your Jeep is gorgeous, it gives me large zikpa, I would not touch any other jeep but yours with my pinakin. Larry's Comment: Video is nicely done Ian. Sorry about the accident. Sorry for what happened that night I wish your xj wouldn't have gotten totaled like that. I left you a comment asking something on your Youtube tribute video. Thanks for reading and keep on Jeepin.